Have you seen Melissa McCarthy’s cringe-worthy portrayal of glossophobia (the fear of public speaking)? She sweats it up and passes right on out as she prepares to give a speech on a topic she’s truly passionate about, archaeology. The scene is so tough to watch that I, too, started sweating just watching it. So, how do I prepare to speak on my own most favorite passion subject without drenching myself on stage? 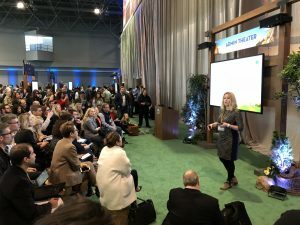 Here are some of my best tips for those who may have the opportunity to speak at a local User Group, at a World Tour, on a Webinar, or even at Dreamforce! Choose Your Niche: Whether you’re speaking on Salesforce to the Ohana, or to your fellow employees, your ability to be a subject matter expert is heightened when you’re narrow and deep on the subject. 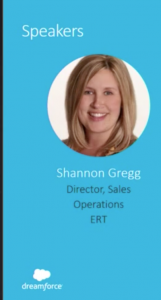 My passion is in truly motivating folks to use the amazing Salesforce system, so I speak on User Adoption and how to adapt your sales process to meet the needs of the users. What truly drives you? What subject is your Google alert set up for? What topic can you truly not get enough of? Follow these drivers to find your niche. Work Your Craft: Take every opportunity you can to practice speaking in front of people to develop a style that is authentically YOU. Speak at church, at team meetings, at Toastmasters, to your family – take the time to get to know yourself on stage. Know when to pace, and when to stand still. When to breathe, and when to allow your voice to rise and fall. I started about 15 years ago with an intensive months-long course from the National Speakers Association, and learned things like how to dress and where to put my hands – these things really matter! Practice Makes Perfect: I’ve read and truly believe that Mark Benioff himself practices every speech seven times. Speaking is just like any other performance – music, dance, theater – and your rehearsal will allow you to ensure you have all of the points down, in the order you want them, so your audience will leave remembering what you want them to remember. Off-the-cuff speaking nearly always leaves you reading from the slides or leaving things out, so rehearse, rehearse, rehearse! Speaking at events is great for professionals – it allows you to connect with audiences who you can teach and learn from, it gives you the ability to share and sell ideas, and it opens doors you’ve never dreamed of opening. I’ve met some amazing folks through speaking, and I’ve learned so much from those who ask me the tough questions and share their own experiences! If you’re considering speaking, find your niche, work your method, and practice that speech – have fun and do great things!